The Witch (2015), courtesy A24. Everyone loves their pets. 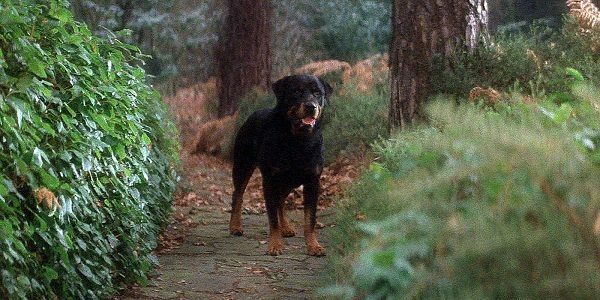 And, as our own Kelly McNeely showed us a few days ago, there are plenty of good dogs and cats in horror movies that are so good that they deserve to get the Pet Sematary treatment and be brought back for another chance at life after they pass. But then, there’s the other end of the scale. Some horror pets were mean and nasty enough in life that they aren’t worth the risk that they’ll come back worse. Like Jud Crandall said – sometimes, dead IS better. Cujo (1983), courtesy Warner Bros. The most obvious entry on this last, and therefore, the first one, is Cujo from, of course, Cujo. Now, Cujo was just a big St. Bernard puppy who happened to get bitten by a bat and catch rabies. He’s a fluffy good boy who deserves a second chance, right? Wrong. The evil Cujo that would come back from the Pet Sematary would be just as strong and powerful as the rabid Cujo, but would have a mean streak that would overshadow his cuteness. It’s best to leave him alone. Man’s Best Friend (1993), courtesy New Line Cinema. Max from Man’s Best Friend is another pup that gets a bad rap. He is a genetically altered Mastiff who is freed from his cruel animal testing lab by a news reporter, and he of course becomes attached to his rescuer. He also becomes very protective of her. Needless to say, things go very badly for everyone who is not his savior reporter. So, unless you’re that reporter, Max should be kept out of the Sematary. He was mean enough the first time. He’d come back even nastier. Monkey Shines (1988), courtesy Orion Pictures. Speaking of experimental animals…Ella from Monkey Shines is a helper monkey who is injected with human brain tissue that makes her super smart. It also makes her super aggressive, and like Max, she develops a bond with her person, who happened to be a quadriplegic. Also like Max, she takes her rage out on anyone and everyone who crosses her master, whether he wants her to or not. Again, unless you’re her person, Ella is not an animal that you’d want to come back. Ben (1972), courtesy Cinerama Releasing Corporation. There are a slew of rats in Willard, but only two – Ben and Socrates – who are named. Of those two, Socrates is the good guy, while Ben is the bad. We already let you know that Socrates deserves the Sematary. Now we’re telling you that Ben does not. At first, he’s an ally to Willard, the young man who has an unexplainable psychic connection to him and his rodent brethren. But Ben seems to take Socrates’ unfortunate demise a bit too hard, and goes out for vengeance until even Willard stops trusting him. That kind of disloyalty doesn’t deserve a second chance. Tales from the Darkside: The Movie (1990), courtesy Paramount Pictures. Cats are cute. But they’re also sneaky, conniving, and, sometimes, in the movies, they’re downright murderous. The cat from the second segment of Tales from the Darkside: The Movie, known only as The Cat From Hell, is so evil, his owner hires a hitman to rub him out. He’s tougher than that, though. Not even David Johansen and a $100,000 bounty can stop the Cat. If The Cat came back from the Pet Sematary, he’d be even more unstoppable. Alligator (1980), courtesy American Broadcasting Company (ABC). Ok, so we’ve covered dogs, cats, rats, and even a helper monkey. Let’s do a reptile. In Alligator, a baby gator named Ramon is purchased by a teenage girl while on vacation. The girl grows tired of her pet, so Ramon is flushed down the toilet. He winds up in the sewers of Chicago, where he grows to monstrous size on a diet of discarded animal carcasses from a nearby agricultural drug test facility. When the animal corpses dry up, Ramon starts feeding on sewer workers before, finally, leaving the sewers to hunt. Not that there’s room for a giant gator in the Sematary, but just in case anyone gets any ideas…nope. The Omen (1976), courtesy Twentieth Century Fox. Any good antichrist needs a Hellhound as a protector, and Damien from The Omen has a fierce one. First showing up at Damien’s fifth birthday party (where the hound psychically convinces Damien’s nanny to commit suicide in front of all of the screaming kids), the Hellhound becomes a faithful and obedient servant over the course of the Omen movies. The Hellhound is evil enough. No Sematary needed for him. Ok, now we’re getting Satanic. And what’s more Satanic than a black goat, right? Although he’s not really a pet, Black Phillip is the goat that is owned by the family in The Witch. He turns out to be much more than just a farm goat, though. He’s actually the assumed mortal form of Satan himself. So, he probably doesn’t even need the Pet Sematary to come back to life. But, just to be safe, we should keep him out of it. Roar (1981), courtesy American Filmworks. Remember everything we said about cats up there? That goes double for lions. And Roar was packed full of lions, tigers, panthers, jaguars, and leopards. Really, any of the carnivorous cats in Roar could be on this list, but Togar, the dominant male lion who challenges pack leader Robbie for control, is the real jerk. Togar and the rest of his pride cause all kinds of problems for the humans in the movie, both on screen and off. Of course, he is a lion, and any attempts at domestication should not have been made in the first place, but an (even more) evil Togar would not be good. No Sematary for him. The Voices (2014), courtesy Lionsgate. And we’re back to domestic cats. And Mr. Whiskers from The Voices is the epitome of a “domestic” cat. Mr. Whiskers isn’t so much evil as he is just an a-hole, which is par for the course. Still, Whiskers is meaner than average. He and his dog companion Bosco serve as sort of the devil and the angel on the shoulders of protagonist Jerry, causing him to kill the women he dates. Or, to be more specific, Whiskers talks him into killing his dates while Bosco tries to get him to stop and turn himself in. Yeah, without Bosco to reel him in, Whiskers would be out of control. He should stay out of the Sematary. Have you seen the new Pet Sematary? Check out our review to see if it lives up to the hype.